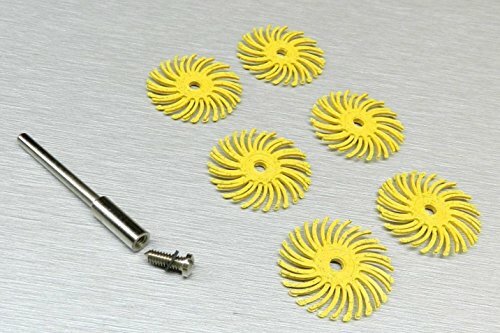 These are the unique 3M Radial Bristle Discs a new type of abrasive that is superior to sandpaper, flap wheels, or other types of sanders, brushes, or abrasive wheels. The 3M bristle materials are long lasting and very effective. The 3M Cubitron and aluminum oxide grains embedded throughout the plastic bristles make them very long lasting. APPLICATIONS: Woodworking - Woodcarvers will appreciate how well they remove the "fuzzies" without harming any of the underlying detail. Die & Mold Shops - when cleaning parts and molds, especially good on hard to polish materials like titanium and valplast. - Coarser grits can be used to clean and remove surface oxides, in carving and grinding,surface texture while finer grits will smooth, burnish and polish. - The 3M Cubitron and Aluminum Oxide grains embedded throughout the plastic bristles make them very long lasting.